We pride ourselves on trying to provide you with quality video of important or unique moments that are, usually, sports-related. 2013 was a big year for that at Deadspin; our top 11 videos accumulated more than three million views, or 20% the average audience for an episode of Two And A Half Men. Here are the 11 videos you considered your favorites of 2013. As always, we encourage you to let us know when you see something interesting on TV by tweeting or emailing us. 3. KTVU & "Captain Sum Ting Wong"
4. 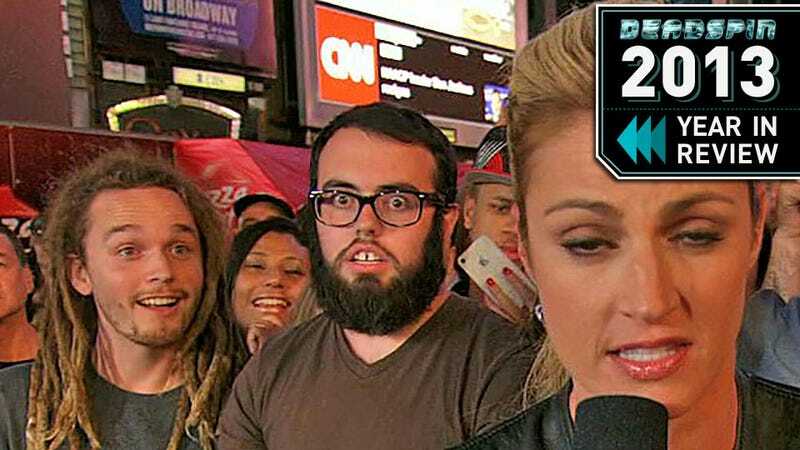 "She Is So Raped Right Now"
Note: YouTube videos are obviously excluded since we've no way of measuring how many views Deadspin readers accounted for. Videos that were part of a larger post not centered around the video (i.e. the Te'o or Boston bombing stories) were also excluded.